Every year, I treat my valentine (and in this case, my three valentines) to a special chocolate treat. As I’ve stated before and hopefully you’ve forgotten, I actually do not like chocolate. And not in the “I’ll eat this but it’s not my favorite” way but in the “if an M&M happens to make it’s way into my DQ Blizzard I might throw something at someone” way. It makes me less likable, I know this. People are literally offended at this fact so I try not to mention it. So, forget you ever read this. Now that we live a stone’s throw away from the mighty Mississip, I found it fitting to take on a truly chocolate pie. 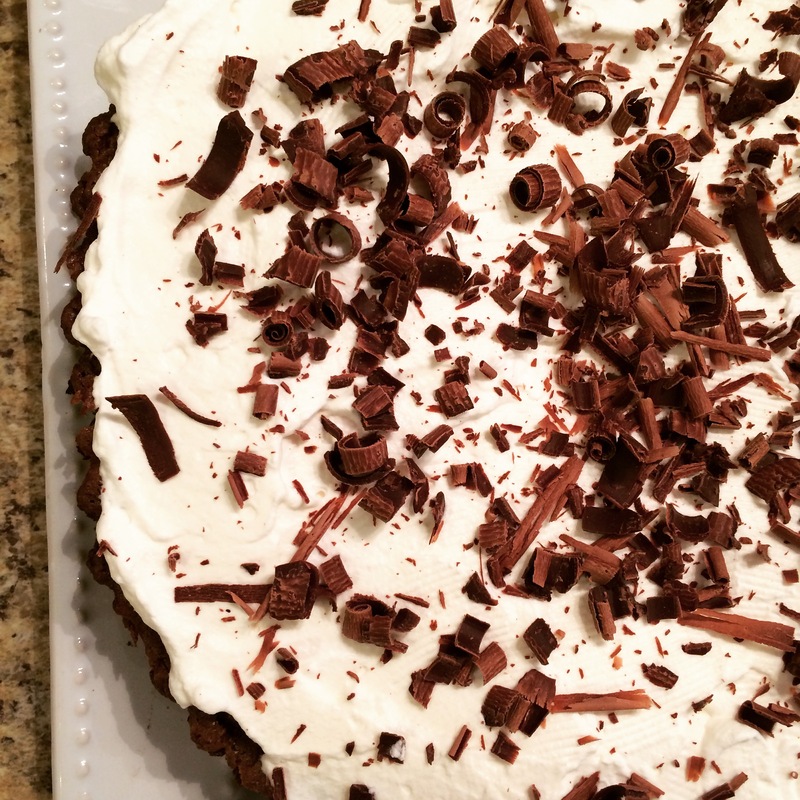 This was almost what I’d consider the Great Pie Fail of 2015, but it surprisingly turned out great. It’s got a flaky chocolate pie crust, an ooey gooey chocolate center and a fluffy whipped topping. Plus the shaved chocolate on top makes it look kind of fancy, don’t you think? 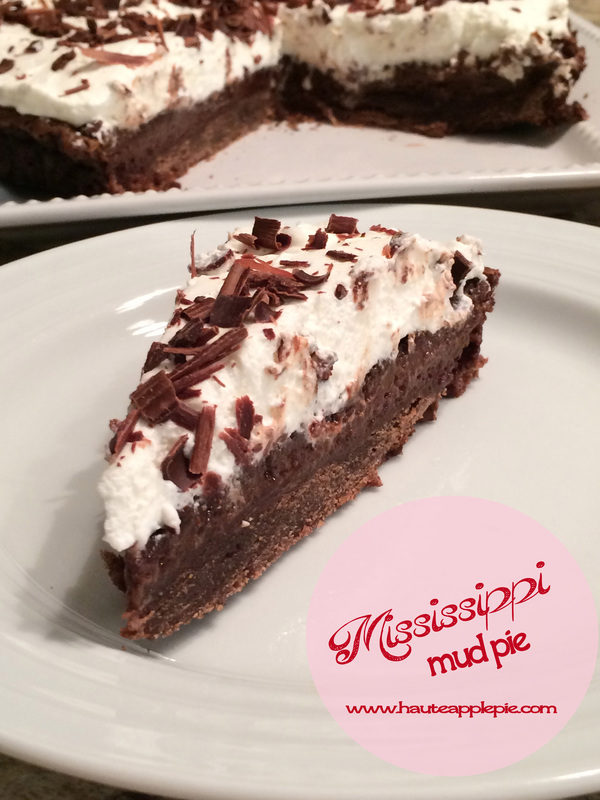 Mississippi Mud Pie Crust: 1 2/3 C all-purpose flour 2 TBSP unsweetened cocoa 1 1/2 sticks unsalted butter, cubed and cold 2 TBSP sugar 3-4 TBS cold water Filling: 1 1/2 sticks unsalted butter 1 3/4 C packed light brown sugar 4 eggs 4 TBSP unsweetened cocoa 6 oz semisweet chocolate chips 1/2 C half and half Topping: 1 C heavy whipping cream 1 bar semisweet chocolate For the dough: Mix flour and cocoa in large mixing bowl. Add butter and cut in with a pastry blender until the mixture is crumbly. Gently mix in sugar. Drizzle cold water over dough and work into a ball. Wrap in plastic wrap and refrigerate for 30 minutes or more. Preheat oven to 350. Roll dough on a lightly flour surface. Place in pie dish or loose-bottomed tart pan. Place parchment paper on top and set dried beans or pie weights on top. Bake for 15 minutes. Remove from oven and remove parchment and beans. Bake for 10 more minutes. Set aside. For filling: Beat butter and sugar on medium speed. Add eggs one at a time until combined. Add cocoa one TBSP at a time. On the stove, melt chocolate chips in a heatproof bowl atop a pot of simmering water, stirring continuously. When melted, remove from heat and whisk in cream. Add chocolate mixture to bowl and beat at a medium speed. Reduce oven temperature to 325 degrees. Pour mixture into pie shell and bake for 45 minutes. Remove from oven and cool completely on wire rack. Transfer to plate. In a mixture with a whisk attachment, beat whipping cream at a high speed for approximately 5-8 minutes or until thick. Spread on top of pie. Using a vegetable peeler, shave chocolate to sprinkle over top. Slice and serve. Can’t get enough chocolate? Try some of these for your sweetie this Valentine’s Day from our friends around the web! Preheat oven to 350. In a large bowl, cream butter and sugar until fluffy. Beat in eggs one at a time and beat in vanilla. In a separate bowl, combine flours with a whisk and in a large measuring cup combine chai and milk. Alternately work in about 1/3 of the flour mixture and 1/3 of the liquid, beating well after each addition. Repeat until all ingredients are beaten in. Beat in chai powder or spices and adjust with additional spice as needed to taste. Batter should be both sweet and slightly spicy. Pour batter into standard muffin tins, approximately 3/4 full and bake for 20-23 minutes. Cool completely. For frosting, beat butter until fluffy. Beat in powdered sugar one cup at a time, adding vanilla and half & half slowly for moisture to achieve desired consistency. Frosting should be thick and creamy. Slit vanilla beans length-wise and use a knife to scrape out the inside and seeds, adding to frosting. Beat well and pipe onto cupcakes. 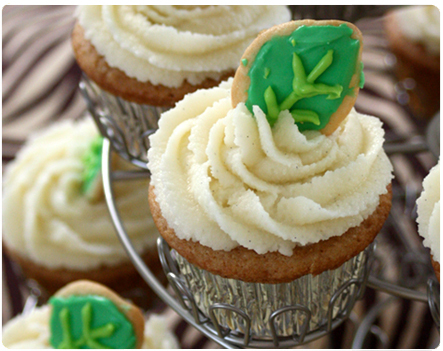 Use a leaf cookie cutter (or a small circle and pinch the ends to form leaves) on rolled out sugar cookie dough. Bake 5-7 minutes. In a small bowl, beat egg whites and cream of tartar until soft peaks form. Use a whisk to whip in powdered sugar and lemon juice until smooth. Add green food coloring and frost cooled cookies. Frosting hardens quickly so work fast! Preheat oven to 350. In a large bowl, cream butter and sugars until fluffy. Beat in eggs one at a time and beat in vanilla and sour cream. In a separate bowl, combine flour, baking soda, salt and cocoa. Alternately work in about 1/3 of the flour mixture and 1/3 of the beer, beating well after each addition. Repeat until all ingredients are beaten in. Pour batter into standard muffin tins, approximately 3/4 full and bake for 20-23 minutes. Cool completely. For frosting, beat butter and cream cheese until fluffy. Beat in powdered sugar one cup at a time, adding vanilla and half & half slowly. Beat in caramel and pipe onto cupcakes. Top with Heath bits. 1. Mixing your dry and wet ingredients separately is worth the extra effort. You get a better batter consistency and more even flavor. 2. Overbaking is the fastest way to kill your cupcakes. When in doubt, always set a timer for a little less time than the recipe calls for and test with a toothpick. You may have to monitor them for the next few minutes on your first batch but you’ll be able to pull them right away when the toothpick comes clean. Even a few extra minutes can dry them out. 3. Make sure your butter and cream cheese are both at room temp before you make cream cheese frosting. If you try to melt your butter (or something else) and beat it into cool cream cheese, it will get clumpy and gross. 4. Let your cupcakes cool completely before you frost. I’m talking a few hours or even over night. Otherwise you risk crumbly cake, melty frosting and a lot of frustration. So I hadn’t planned a follow-up post to the Iron Cupcake: Beer competition but I just had to share this. 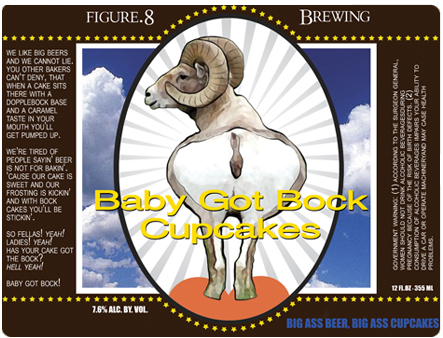 While my Baby Got Bock cupcakes – chocolate with homebrewed dopplebock beer, caramel filling, caramel buttercream frosting and Heath bits – didn’t win, they did make local and national news! My wonderful new friend, Sara, from Cream City & Sugar passed along the link to the MSNBC video (via WTMJ4) which would have otherwise slipped under my radar! I’m thinking this could be the beginning of a reality show…Project Haute Homemaker?? Bravo, are you listening? Watch the video on MSNBC! The next Iron Cupcake competition is bacon if any of you Milwaukee/Chicago folks feel up the challenge!